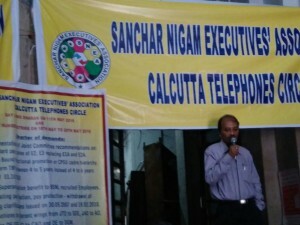 Com Dilip Saha CS, Com Nirmal Sarkar President, Com Sankar Sanyal Jt Secretary(E), Com Aparesh Ghosal CWC and Com Soumen Ghosh ACS met GM/HR & Admin expressed serious concern for not endorsing the release of about 25 nos of SDEs inspite of being being released through ERP from Corporate Office. Association had always proposed to endorse the transfer order( before release through ERP) with definite date of release at the earliest. 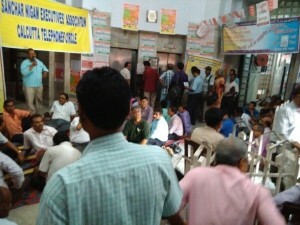 But unfortunately, it is observed CTD has taken steps which is unprecedented in BSNL. GM informed that CTD had requested for retention for a short time to meet the acute situation. 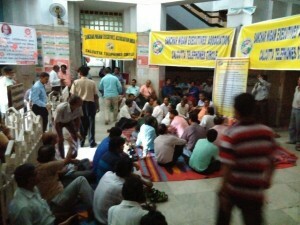 Association vehemently opposed such move, particularly when release from Corporate Office has already taken place.The executives affected have already sent their respective families for admitting their wards in school, vacated their rented residence and are putting up in hotels Rather, the endorsement of transfer order pending in respect of DEs should also be endorsed without further delay. Or otherwise, the same fate will befall on DEs too. Such endorsement will allow the local admin the time to plan out with additional charges. In nutshell, all executives who stand released through ERP be released immediately and pending transfer orders be endorsed immediately with definite date of release at the earliest. GM said to take up the matter with CGM. In matter of delay in payment of leave encashment, association informed to have met GM/Finance in this matter wherein it was suggested to take up the matter with GM/HR. Association demanded for immediate resolution of the issue at HQ since many more cases of non payment is pending since long. GM informed to have received a file on the subject from DGM/SEA and that he would discuss the issue with all stake holders before taking concurrence from the competent authority. Association once again reminded on processing the case for promotion to PS. GM informed that matter related to roaster is over and that he had sought some clarification on method for calculation of vacancy. After examining, he assured to expedite the exercise for completion. Reversion of Swampa Datta, JTO/CMTS. 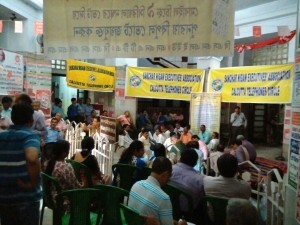 Though the reversion had taken place in accordance to the directives of court and conveyance of the same from Assam Circle, yet association felt the directives for pay recovery is not applicable from the retrospective date, The executive is entitled to JTO’s salary since she has discharged duty in the capacity of JTOs till the date of reversion. Moreover, a legal view would be sought to review the vacancy position to explore tenable means for reinstatement. GM replied to examine the representation in accordance to extant rules on the issue. LICE for promotion from TTA to JTO.and review of answer keys in accordance to corporate guidelines– Close to 180 nos of TTAs are appearing in LICE. Association requested to ensure the exam is held without any glitch. Since, several court cases have delayed the event, any shortcomings will give lead to litigation. Since, this is one great opportunity to get JTOs to meet the acute shortage in CTD, the administration must take all measures and hope all succeeds. GM replied to have monitoring the process. Though CTD is having no direct role in matter of conducting the exam, yet work entailed with CTD is being done with care and in time. In matter of review of answer keys, Association requested to expedite the process since the date of LICE is on 22/05/2016. In that case, those who stand a chance to qualify will get spared from writing the exam. GM said to have already instructed to complete the exercise in time. Com Dilip Saha, CS, Com Nirmal Sarkar, President and Com Soumen Ghosh, ACS met GM/Finance to remind him on the stalemate on payment of leave encashment in HQ unit. Association pointed to some long pending cases awaiting payment due to absence of decision in earmarking the unit responsible for such payment. Association is of the opinion that whichever unit be made responsible, the delay in taking the decision should not make the retirees suffer. GM said to be aware of the issue and requested to have a discussion with GM/HR too. Association also expressed thanks for resolving few long pending request cases. 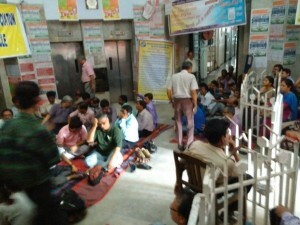 Hordes of activists assembled at Telephone Bhavan to observe the call given by SNEA. A massive gathering sat through the day, sloganeering against the management for utter insensitivity and apathy towards resolving the long pending demands. The crowd, overwhelmed by the spontaneity of participation, vehemently demonstrated for settling the issues of E2 & E3 IDA payscales for JTO/JAO & SDE/AO, CPSE Hierarchy, 30 % superannuation benefit for BSNL recruitees, officiating pay protection besides others. High pitch slogan rented the air. Circle Office bearers addressed the gathering enlightening the members on the justification of the demands and the necessity for trade union action. Com Nirmal Sarkar, President dwelt at large on the double standard adopted by some associations to derail the process and how hypocrisy could land the entire cadre to doldrum. He cited how SNEA is honestly pursuing the issues to see a productive end. Com Sankar Sanyal Jt Secretary(E) informed on the role of CHQ in mounting constant pressure on management to respond and act in time. He also cited how some groups are bent upon to raise new demands when things are under finalisation. This is nothing but to rattle the progress made so far. 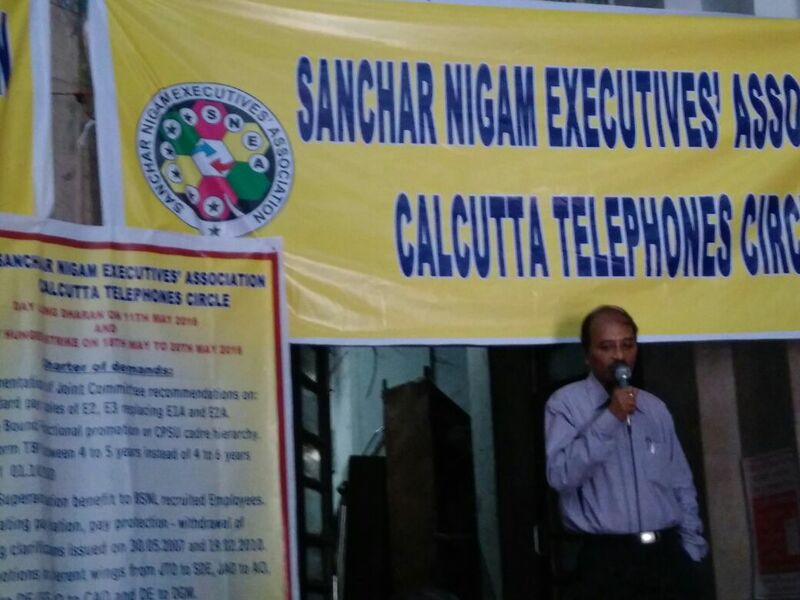 Com Dilip Saha, CS explained the significance of this protest programme in the light of the ensuing 3rd PRC. Unless the fundamental demands for E2 & E3 payscales are settled, CPSE Hierarchy cannot be finalized. The matter assumes critical significance since constitution of 3rd PRC is reportedly learnt to take place soon. In such circumstances, the recommendations for higher payscales would stand jeopardised resulting in stagnation in career progress for all, more intensely for the JTOs/JAOs recruited in 2007/08 onwards The issue of 30 % superannuation is also equally important since the management in Jaipur AIC agreed to extend further 6% towards terminal benefit. If materialised, it will set course for further demand to reach the ultimate goal of 30%. The issue of officiating pay protection has been utterly ignored by extending incorrect interpretation from Pers section. It is surprising that inspite of Apex court’s verdict , Dot’s order, the item is being dragged beyond reasons. So given the dealing of the management on various issues, he called upon all to gear up for further course of action. Com Soumen Ghosh, ACS reminded the grassroots to remain alert and active for further course of action, if management do not respond to the justified call in time. He urged upon the Zonal Secretaries to make wide circulation on the status of the pending issues and mobilise the members to participate in a strong way. Next Program- Relay Hunger Strike- on 18/05/2016 and 20/05/16 at Telephone Bhavan. CS, President and Jt Secratary ( E) met CGM/CTD to apprise him of the critical situation that would arise if large number of executives are released through ERP. 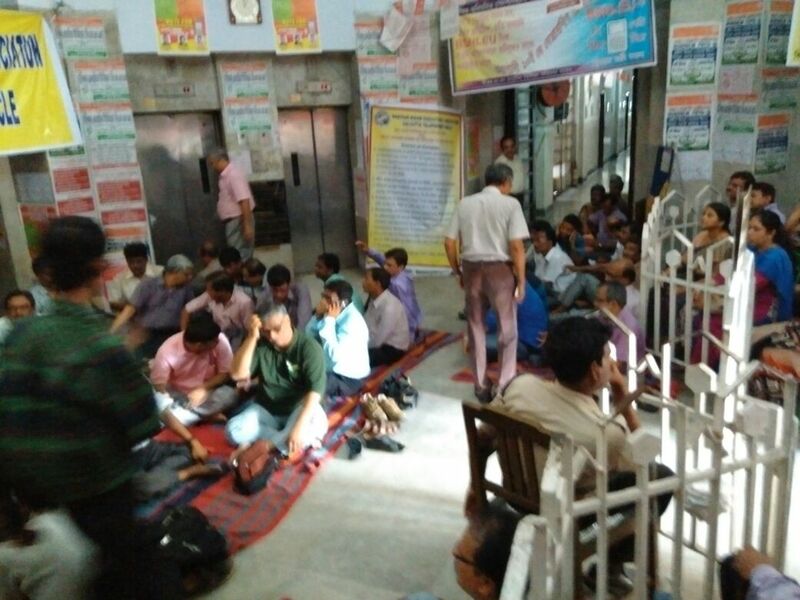 Once again, association strongly demanded to contemplate on staff reorientation under various GMs on interim basis till substitutes are provided from the ensuing promotion/recruitment, so that the executives under inter-circle transfer order could be considered for release at the earliest. It will be imprudent to wait and watch, if sudden and bulk release of executives take place. It is reportedly learnt and also in accordance to Corporate Office latest order ”on release through ERP”, there remains a possibility of release and more so, since the transfer order got issued in Nov’15 i.e about six months. Association is vigorously pursuing at CHQ level for posting of substitutes for executives at the earliest. CGM replied to take stock of the suggestions made by the association for his discretion. Association, once again reiterated for early decision in this regard. Make all out preparations for the success of the Mass Dharna on 11.05.2016 at BSNLCO, Circle / SSA HQs. Resolution of the issues fully depends upon the success of the TU programmes. 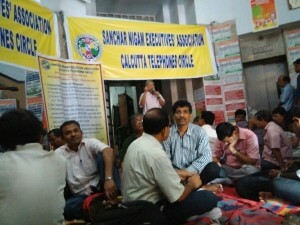 All important issues like promotions, standard pay scales before 3rd PRC, CPSU Cadre Hierarchy and 1st TBP, pay protection, memebership verification, notion pay for Civil/Elect etc etc are pending for years together.All the Executives are requested to participate in the Dharna and make it 100% success.The valiant comrades of SNEA, the real fighters and all the Executives together will once again prove what struggle is and how the issues are to be settled. Com Dilip Saha CS, Com Nirmal Sarkar President and Com Sankar Sanyal Jt Secretary(East) welcomed and congratulated Shri Sanjay Ghosh on assuming charge as Dir Vigilance of CTD. Association, after a cordial exchange of introduction, had discussions in general on the state of affairs in CTD and how it could be turned around. Shri Ghosh shared his experience in vigilance during his last stint and excuded confidence to deliver. Association. assured to extend support and cooperation for the betterment of CTD. May Day greetings to one and all. On this Day, let us remember the martyrs who sacrificed for the working class.